The first outbreak [of piracy] began around 1695 and lasted until about 1725. 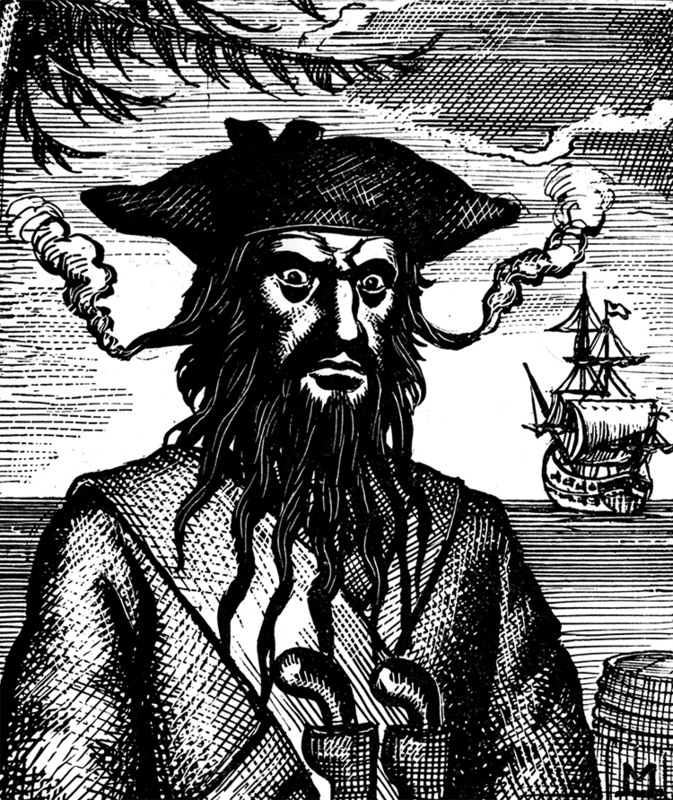 Most of the approximately one thousand pirates decided to accept a king's pardon in exchange for giving up a life of piracy, but a few, determined to carry on, were either captured and hanged or driven from the islands. "It is a misfortune to the patriots of South America that their flag is abused by a set of desperadoes who aim at nothing but plunder." The captain said he was unable to determine the pirate crew's nationality as he heard them speaking English, French, Spanish and Dutch. ...the pirates directed the Sophia to cruise back and forth outside the reef while the schooner sailed in the survey and anchorage. "as snug a hole as buccaneers could wish"
Fearing for his life, Savage appealed to the pirate's captain for protection. The captain, a Spaniard who did not look the part of a pirate, took Savage to his schooner, where he told him that he had no control over his crew; they would do whatever they pleased. He advised Savage to tell the pirate crewmen where his money and valuables were concealed and, if he did so, his life would be spared. The next morning, two more pirate craft arrived, and a boat crew from the first schooner again boarded the Sophia. They said they had come back to find the gold and other valuables and, if they were not told where they were hidden, they would hang everyone and set the ship on fire. But the Navy ships were too few in number and too large in size to be effective against pirates who operated in small craft hidden in shallow inlets, coves and rivers. Five heavily armed Spanish pirates boarded the Dover shortly after she left port, beat the crewmen severely, and stole everything of value they could find. The captain later reported, "They then ordered us to stand north [away from the Cuban coast], or they would overhaul us, murder the crew and burn the vessel. We made sail, and shortly after were brought to [stopped] by another boat of the same character, which fired into us, but left us upon being informed that we had already been robbed." After taking off the ship's [the Aurilla] cargo, the pirates used a clever ruse to find out where the ship's and crew's money was concealed. They sent the crew below with a guard, then killed a chicken and dripped its blood over the anchor windlass and come of the cutlasses. They brought a crewman on deck and then concealed him under guard in another part of the vessel. Bringing up another sailor, they surrounded him with drawn cutlasses and demanded he tell where the money was hidden. When the man refused to talk, they told him that the first man had lied and had been killed an tossed overboard. Seeing the blood on the windlass and cutlasses, the sailor confessed all he knew about hidden money. ...each crewman was interrogated until the pirates knew where every bit of money onboard was hidden. [Some other schooner] After he had revealed the location, they tied him to the deck on a bed of oakum, soaked it with turpentine, stuffed oakum in his mouth and set him on fire. They hanged another seaman from the yardarm and crucified the boatswain by spiking his feet to the deck and his torso to the tiller. They dispatched the final crew member by blowing his head off with the swivel gun. Even the ship's dog was not spared: They shot him twice then cut out his tongue.